The 2017 Outsound New Music Summit kicked off this Sunday with the annual Touch the Gear event. As always, there were several musicians and instrument-makers were on hand to demonstrate their setups or inventions. Above we see Alphastare demonstrating his setup for processing of synthesized and recorded sounds that he uses in his live shows. Below, CDP bandmate Tom Djll shows his analog modular synthesizer setup with sundry external boxes for expressive control of sound. 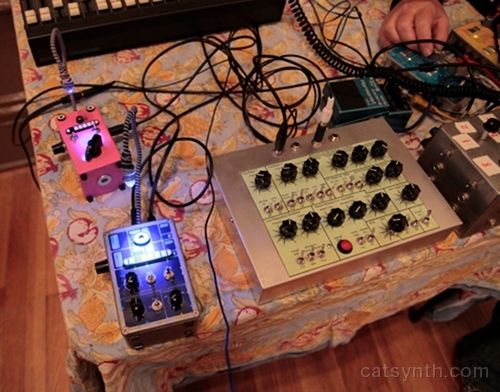 I opted to show my modular synth as well this year, along with the Moog Theremini. The theremin is always a popular item at this event. Kim Nucci demonstrated some custom modules alongside a Korg MS-20 mini and a DIY metal instrument with sensors. I have always found metal plus electronics a musically interesting combination. Among the more unusual and surprising instruments this year was Dania Luck’s musical chessboard. 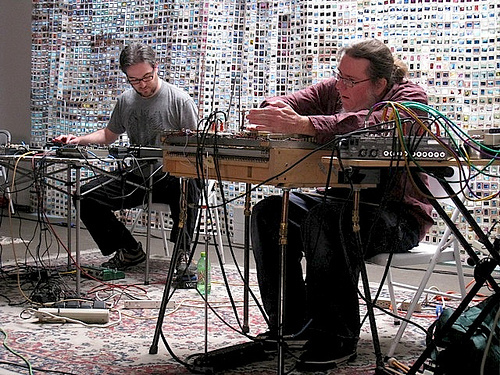 It contained sensors for the magnetic chess pieces, with each square of the board triggering a different synthesizer in a SuperCollider patch. This wasn’t the only SuperCollider program being shown, as our friend Tim Walters demonstrated his patch and controller setup. It is the setup he will use as part of Usufruct in the opening concert for the Summit. 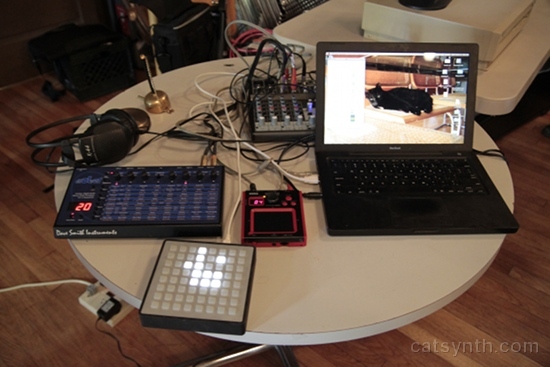 Tim Thompson was on hand with the latest incarnation of his electronic-music instrument, the Space Palette Pro. It uses the same software as previous versions of the Space Palette, but with a new more compact interface based on new touch-sensitive pads from Sensel Morph. These pads are quite impressive in both response and feel, and we at CatSynth will definitely be looking into them. Not all the demos included electronics. There were several acoustic instruments demonstrated by the Pet the Tiger collective (David Samas, Ian Saxton, Tom Nunn, Derek Drudge), including this beautiful kalimba tuned to 31edo. I would love to write a piece for it one of these days. There was also a large metalophone with a deep resonant tone, interesting tuning, and some satellite “bass” notes. Back inside the hall, Motoko Honda demonstrated a network of electronic devices processing voice, along with a fun circuit-bent instrument. 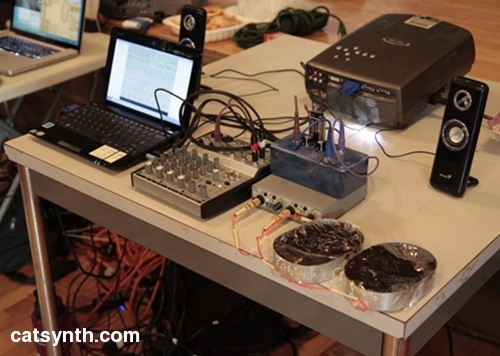 Matt Davignon brought his setup for expressive manipulation and processing of samples and other pre-recorded sound materials. We would also like to thank Matt for his efforts organizing this event every year! We would also like to thank the folks at VAMP for co-presenting and bringing a pop-up shop of records and sundry vintage and musical items. The 12th Annual Outsound Music Summit began this past Sunday, opening as always with the Touch the Gear Expo. 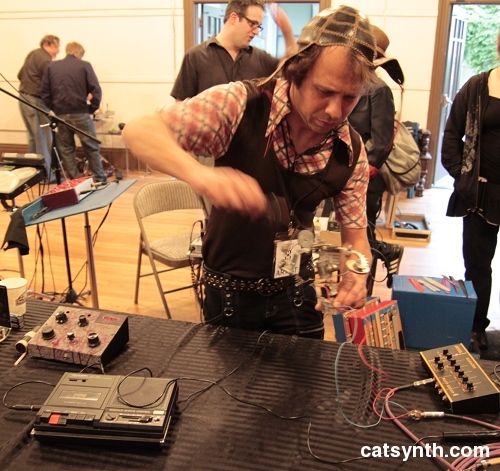 Musicians and sound artists from the Bay Area and beyond were on hand with their musical devices and inventions for the public to observe and try out. I participated this year with two technological extremes: soft synths on an iPad, and a full two rows of Eurorack format analog modules. Both offerings were quite popular, eliciting curiosity from visitors of all ages. There were quite a few analog synthesizers on hand, including a vintage Serge modular courtesy of Synthesizerman (aka Doug Linner). One of the more intriguing analog synths I encountered was this creation by Andy Puls. The circular pattern represents a step sequencer controlling an internal sound generator. Conductive pegs can be moved around on the bars to change pitches and other parameters. There are also knobs as well. The overall geometry, control design and lights made this a visually appealing instrument. Nick Wang also demonstrated some custom analog boxes with controllers, oscillators and a VCF. 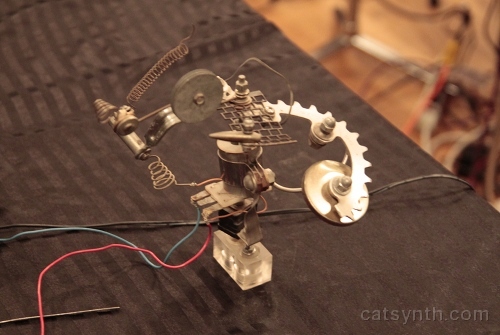 Fernando Lopez-Lezcano demonstrated his elaborate homemade analog synthesizer. I have had the privilege of hearing him play it in a formal performance. Matt Davignon demonstrated his devices for working with fixed-media sources, a bit of a preview of what we can expect for Friday night’s PMOCOTAT performance. Acoustic creations, in particular sounds from natural sources, were a common theme this year as well. 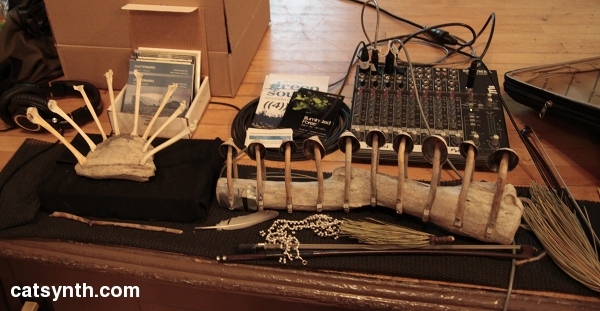 Cheryl Leonard demonstrated her expertly tuned instruments made from stones, bones, shells and wood gathered at the extremes of the earth. She also demonstrated her virtuosity with using these elements together, such as generating rhythms from a series of bones passed over the shells. David Samas was also on hand with his musical creations from natural sources found here in northern California. Missing from the picture above is his tuned aluminum rod, from which one can get quite a powerful sound with a well-rosined hand. I had the opportunity to try it out myself. Bryan Day presented his instruments made from found objects, including the tape measures featured prominently in the image below. Other sources included springs and metal rods. His creations are quite ergonomic and easily to play, putting unusual sources into compact and intuitive arrangements. Horaflora combined acoustics and small electronics in a couple of lively offerings, including drum heads excited by magnets. I heard him play this in a program several months ago. David Molina (aka “Transient”) also blended acoustic and electronic ideas. 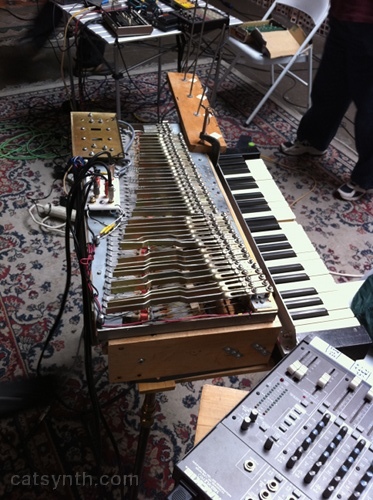 He had a variety of small instruments and sound sources on hand, which he used to generate source material for complex loops and textures controlled in real time via Albeton live. Tom Nunn, a prolific inventor whom I interviewed in 2012, was once again presenting his creations. This time it was an exceptionally colorful set of his Skatchboxes. There were others presenting as well, and unfortunately, I did not have time to see everyone and also attend to me own station. But I hope to see more of all the participants in more musical settings. The Outsound Music Summit continues on Wednesday night with the first of the formal concerts, you can see a full schedule here. And of course, you can always follow along with @catsynth on Twitter if you can’t attend in person. Today we review the Music of Invention: A Concert Celebrating Tom Nunn’s Inventions which recently took place the Community Music Center in San Francisco. 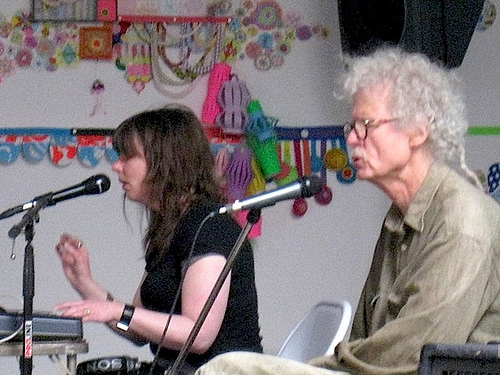 This retrospective concert brought together not only many of Tom Nunn’s musical inventions from the past decades, but many of his closest musical collaborators as well. The evening was divided into several miniature sets, some with established ensembles as well as individual collaborations. Most of the names on the program were quite familiar, and I recalled from my interview with Nunn his describing the “master players” he has been fortunate to work with over the years. The concert opened with a “inventors’ duo” as Tom Nunn performed alongside music-instrument maker Bart Hopkin. The first sounds were scratchy and metallic, primarily from Nunn’s instrument, the crab. Hopkin’s instrumental performance started out quite percussive as well but soon settled into a more tonal marimba-like state, albeit a tonality with an odd scale. The crab seemed to have two types of sound and texture that reflected the different types of rods, one louder and more metallic, and another more quick and watery. They settled into a pattern with quick rhythmic textures from the watery sounds and bass notes, with a steady rhythm forming and then breaking apart and then forming again. Hopkin switched to one of his other instruments, the ‘Moe, a clarinet-like instrument with a continuous pitch control. Although the sound was unmistakably that of a clarinet, the rapid pitch bends sometimes made it sound more like an analog synthesizer (with a square wave, of course). Against this, Nunn generated a musical “waterfall” from the crab that concluded with a harp-like arpeggio. This was followed by a performance of Allan Crossman‘s piece Plasticity. This was one of the only fully composed pieces on the program (the other being Skatchbox Blues). Originally for Sonoglyph and orchestra, on this occasion it was reduced to Sonoglyph performed by Nunn and piano performed by Crossman. 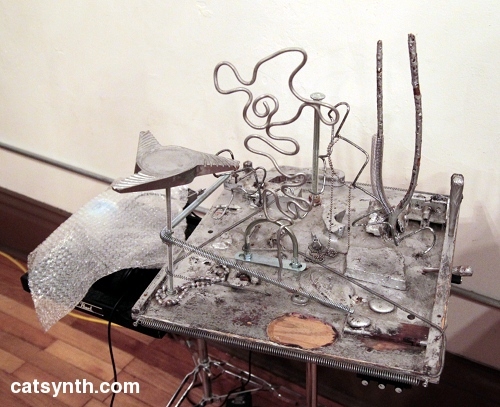 The music began with metallic watery sounds from the Sonoglyph and anxious harmonies on the piano. The overall effect was quite dreamlike, and I had the impression throughout the piece of being a well-crafted children’s movie with a richly detailed imaginary world. 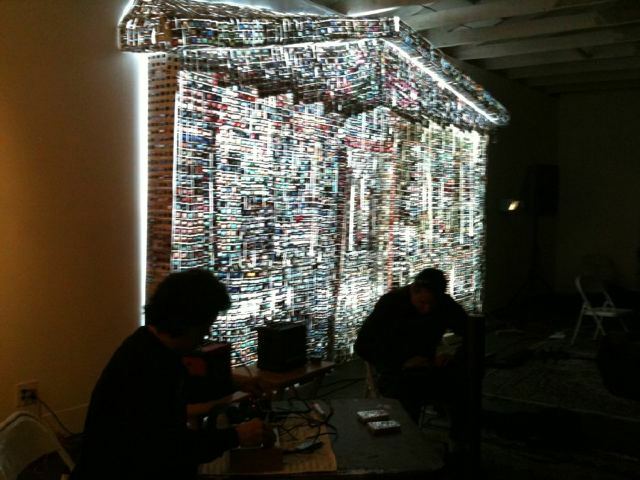 The instrumental sounds ranged from resonant and chime-like to more scratchy and noisy. There were sections with traditional contrapuntal textures, humorous phrases, and even something that brought to mind a march or procession. The next set featured the Octatonic T-Rodimba, a pitched instrument tuned to three separate octatonic scales. Nunn was joined for this set by guitarists Gary Knowlton and Michael Knowlton. From the start, it was a clash of timbres between the guitars and the T-Rodimba, with slow chords against fast runs. Over time, the guitars became more melodic and all three performers settled into a jazz-like feel. The rhythms were all separate at first, with scratchy guitar sounds providing percussion, but coalesced into a single unit with repeated phrases. Certainly, the octatonic scales were part of the music, but not a distinct part to be heard separately. With the rhythms aligned, the tonalities of the different instruments blended together. The music became louder and more percussive before concluding with a guitar drone and effects from the green Line 6 pedal many of us know and love. 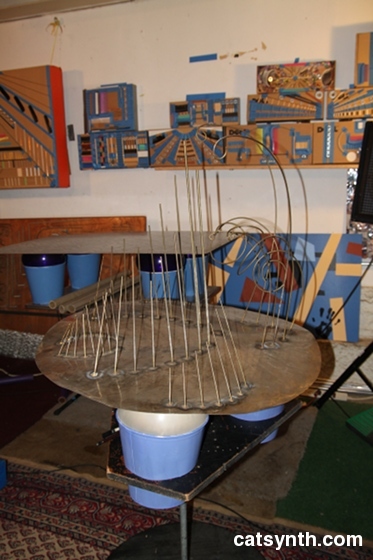 The following set introduced the Lukie Tubes, an instrument with a resonant metal plate suspended on balloons that excited using a series of cardboard tubes. Nunn was joined by Paul Winstanley performing on “prepared electric bass”. He performed by bowing on the bass, which had several rods inserted between the strings and the neck for a variety of sounds that were enhanced by additional electronic effects. The bass blended will with the Lukie Tubes as the set began with a long metallic drone on both instruments with different resonances coming in and out of focus. The overall effect was a lush but eerie landscape, punctuated with bits of static and shorter tones. The were moments that brought to mind whales and others reminiscent of Central Asian throat singing. In addition to the acoustic strength of Lukie Tubes, Winstanley used another Line 6 pedal to build up energy. The loud sounds gave way to softer higher tones and then a quiet but more percussive conclusion. The final set of the first half featured RTD3, a trio of Ron Heglin, Tom Nunn and Doug Caroll. I have heard RTD3 on several occasions in the past. For this performance, Caroll was on cello as usual, Heglin was performing only on voice (i.e., no trombone), and Tom Nunn was on Skatchbox. In particular, this was the debut of one of the “perfect” Skatchboxes that I had seen during the interview. Musically, things start of softly with voice a percussive cello. Heglin’s vocals featured a wide variety of effects, groans, gurgles and rumbles, along with incantations on unknown (and perhaps unknowable) words. The vocals filled the space in between the cello and the distinctive comb noises of the Skatchbox. 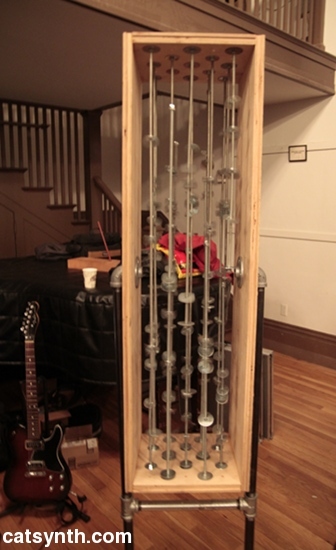 Nunn switched to Lukie tubes during the performance, and then to another instrument called the Techphonic plate. During this time Caroll’s cello performance moved from traditional practice (pitched bowed tones) to more plucking and percussive techniques, and finally to extended techniques such as using a cork on the strings and scratching on the back of the instrument. 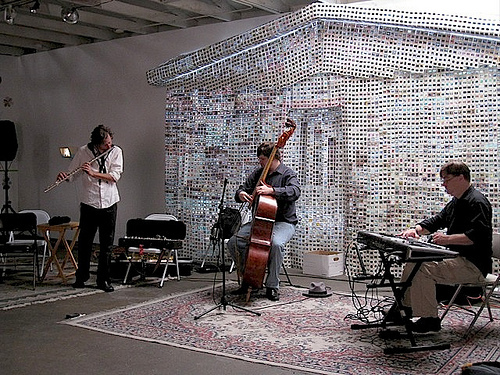 All three performs came together for a final drone that ended with a minor modal harmony. 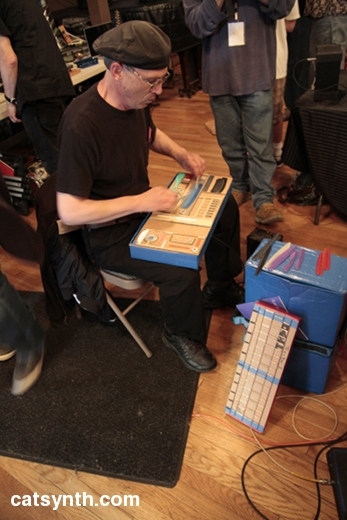 The next set featured Ed Herrmann on the Octatonic T-Rodimba with Nun on the Crab. Here, the tonality and timbre of the T-Rodimba was used to full effect, with Hermann performing rhythmic phrases and switching among different types of mallets. 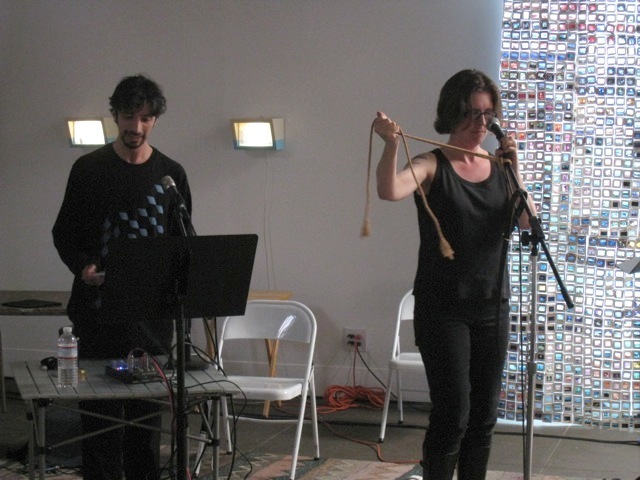 Between the two metal instruments and rhythmic texture, this set was particularly “gamelan-like”, with call-and-response between the two performers and moments of synchronicity. There were moments of slower movement and empty space as well. During the set, I heard something from hall which I dubbed at the time “unexplained bass”, a series disembodied low bowed tones. It turns out the Doug Caroll was had quietly slipped into the audience with his cello and joined into the mix. The acoustics of the hall helped to give his addition a more surprising and disorienting quality. But overall, it did add a supporting quality to the music and a contrast to the more metallic sounds. The overall effect reminded me quite a bit of the music of Harry Parch. TD Skatchit, the Skatchbox duo of Tom Nunn and David Michalak, made its official appearance with a pair of mini-sets, each with a guest soloist. The first featured Rent Romus on saxophones. The result was a delightfully noisy set the requisite squeaks, squaws and other effects, punctuated by more jazz-like tonal phrases. Nunn and Michalak provided a rhythm trading notes on the Skatchboxes. The tones were more of the continuous scratches and rumbles, but after a grand pause, Nunn produced a more rhythmic sound from one element of his Skatchbox with a repeated beat that reminded me a bit of rumble strips. The music gradually grew louder, with more complex and intricate jazz runs. Ultimately, Romus pulled out both an alto and soprano sax to play simultaneously in a loud and intense final run. The final performance featured Ghost in the House, with Nunn and Michalak joined by regular group members Karen Stackpole on metal percussion and John Ingle on saxophone, and guest Bart Hopkin. Like RTD3, I have seen Ghost in the House a few times before. This time they did not do their usual ritualistic procession into the hall, probably because of the logistics involved, but they appeared on stage bathed in eerie blue light punctuated by candles. The opening sounds were quite resonant and featured rich harmonics. Nunn’s instrument, the Crustacean, blends quite well with Karen Stackpole’s gongs, and a rhythm emerged in the beating patterns between the instrument. Layered in between was Michalak’s lap-steel guitar, which always seems to have a melancholy sound. Bart Hopkin’s instrument, called the Disorderly Tumbling, provided a cascade of high bell sounds that lingered above the other timbres. In a performance like this I find myself listening for the details such as these. Others that caught my attention in this section of the performance were Stackpole’s row of keys, Ingle’s swelling saxophone town, and intense sound of the bowed Crustacean. Over time, the texture became more sparse and glitchy, including mouthpiece noises on the saxophone, striking of metal bowls, and short notes on the Techphonic plate. The music then moved into an eerie phase with lap steel drones, toy-like sounds and the Lukie tubes that reminded me of an old radio or classic science fiction soundtrack. The tones became richer and darker, with long tones and wiggling metal sheets, saxophone multiphonics and glissandi; and finally more rhythmic, with bouncing high tones and the cascading bells, matched by saxophone and gong. The concert was well received, and there was quite a long moment of mutual appreciation between Tom Nunn and the audience. This was clearly a special occasion for him, for the musicians and those in attendance. There was also a warm recognition of David Michalak, who was primarily responsible for proposing this concert and making it happen as well as it did. It was quite a logistical feat to have so many sets with large and unusual instruments. We conclude with what I believe is the smallest invention of the evening. Nunn had made several limited-edition mini-Skatchboxes to commemorate the evening. One of them went home with me and waits to be used in a future musical project inspired by what I heard at this concert. This past Monday, I visited the studio of musical instrument inventor Tom Nunn to talk ahead of his upcoming retrospective performance at the Community Music Center in San Francisco on Friday February 17. The full interview appears below. AC: So why go through the trouble of invention? Why invent a new instrument versus learning existing instruments? TN: To me, they create a more interesting compositional format, or forum, I should say. They open up possibilities that traditional instruments can’t, because of tradition. Traditional instruments come with tradition, that’s why they call them that. That means that that’s a whole set of expectations that are historically and culturally determined before you even start saying anything. So, in experimental and improvised music, what I get from traditional instrumentalists is that they are trying to get beyond the traditional instrument. So they use different techniques and they use, you know, very imaginative ways of looking at the instrument as a sound-making device. Well, that’s what I am doing with found objects and then ultimately constructions out of found objects. So, we’re all on the same path. What we’re trying to do is, and what all artists and creators have tried to do is, extend and evolve tradition, not simply represent it. And it’s no disrespect to tradition because we wouldn’t be here without it. So I’m doing the same thing that Philip Greenlief or John Butcher or any of the rest of them are doing. It just happens to be with these things instead of those things. We have the same language, we have the same orientation to sound, and we bring to that an expression through phrasing and proportion that represent classical training and sensitivities. AC: OK, so we can go from the “why” to the “how.” So if you were to begin a new instrument, or a new invented instrument, how do you begin that? Does it start with a particular set of materials or objects, or a process, or a particular musical or sonic idea? TN: I think it starts with the material that you discover. You discover something about material or some combination of material or use of material that is sonically interesting, and then you see what you can do to shape that material to see if it’s musically interesting. And then you see what is involved in shaping that material and start focusing on that evolution from the sound of the material to the understanding of the material and its relationship to how you make it work, the techniques you use on it; and then finding the best designs for those techniques to accommodate those techniques. Tom Nunn, Lukie Tube from CatSynth on Vimeo. AC: Yes, so what was your first invented instrument that was used in a performance or a recording? TN: Oh, that’s difficult to say, because I got into this when I was a graduate student at UCSD, and we were doing outside of the class outside of the university a pro-active socialism with music. And so we would go to a park and set up found objects and get the public involved in that. And I was interested in both the sociology of that and the composition of that. 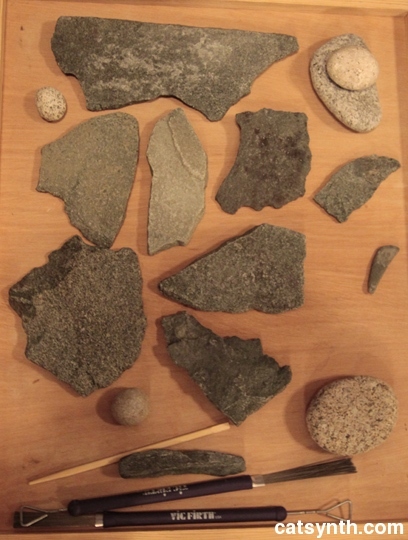 But the main thing was that it’s just an evolution of these materials and circumstances they exist in. So what I was getting at is I guess it was hard to say what the first was. Maybe the first was a gas bottle. Maybe the first was a certain way of using some material. The first constructed instrument that I called and have stuck with and keep to this day is the Crustacean. It was about 1977. And again, we had already discovered that rods work with plates and plates sit on balloons so it was a refinement already. AC: OK, and then presumably since that time there’s been more refinement learning from previous ones. So what sort of things have changed since this early instrument, or since those early performances? What sort of things have you learned that have been put to use in the latest instruments? TN: Well, it was not so much a linear evolution in one direction. Those plates on balloons with rods, space plates I call them, that was one way, and actually didn’t go very far beyond that. What I got into were electro-acoustic percussion boards and that’s like the Bug and the Crab and these things on the wall here, Techphonic Plates, and ultimately the T-Rodimba. So it was basically hardware devices attached to plywood with a contact mic on the board. That was it. You play them with different things in different ways. But I used combs in that. And ultimately over the years, over many years, I got to the point of realizing that the combs were wearing in a certain way and how would I accentuate that because they seemed to be getting better. Therefore, because of the shape they were better. What if I started experimenting with shapes of combs or what if I started experimenting with things I put the combs on? So in a sense it was an evolution from electro-acoustic percussion boards and the technique of using combs into the creation of the Skatchbox, which was a new thing. 2008. AC: OK, so actually I was going to ask about the Skatchbox. Visually, it seems a little bit different from the other ones and it’s more “reproducible.” And even though each one is unique and there are quite a few of them – there was the workshop we had at Outsound a couple of years ago. And even looking around the room there is almost like you would have with saxophones, like a soprano and a bass. So just a little bit more about the evolution of the Skatchbox and the different varieties and the different ways it can go? TN: Yeah. Well, it started with the implement, oddly enough. It was almost like inventing a stringed instrument because you happened to have a bow. So that’s how that instrument evolved. It evolved out of the implement and to a certain extent technique because what I started with was a blank cardboard box. A big huge box that I found on the sidewalk that I put aside saying “I must be able to use this. It’s much too neat.” So I tried the combs over it because I had incidentally scraped a box that was full of National Geographic magazines, so it should have been really dead. But it wasn’t. It was very alive, resonant, as long as I was making the sound and when I stopped making the sound it stopped. And so I thought, “Hmmm. Wow.” So I started experimenting with how I pushed the comb across that cardboard box. Then I tried it on the big empty box on a keyboard stand. And then I started taping objects down to that to see what that does. And then like a silly goose I put a contact mic on the other side of the box and said “Well, that doesn’t work.” (And I said, “Well, maybe that’s a good thing”). But then I realized, no, put the contact mic on the inside of the top just like you would the plywood sheet and I did and it was like “Oh my god!”. It was like “God, this is five times more efficient than plywood.” Ten times. It was incredible. So I had a kind of “articulation instrument” that I had always wanted and never had. I always felt in recordings my instruments sounded like they were in the next room compared to everybody else, especially electronics. So this now has the presence and dynamics and articulation of electronics. I can take on any electronics with this. So that’s how I developed into these things and I just tried different layouts and designs of stuff and evolved different materials that I put on them and different techniques for putting them onto the box from tape to glue. And then it became more specific and more prototypical and more evolutionary…until I got these two which are perfect. AC: OK, we’ll take a look at the perfect ones. AC: Alright. That actually leads to one of the next questions that I had, which is that when I have been hearing the performances over the last few years, I am often struck by how the timbres remind of electronically generated sounds. I know there are the contact mics and the electro-acoustic aspect through that, but it is still coupled with acoustic sources. And in designing or evaluating the sound, is the relationship between electronics or the mathematics of sound? TN: Not really, not really the mathematics at all. The closest thing I have to anything like that would be – well it’s not even mathematics, it’s scale-wise. The only scalar instrument is the Octatonic T-Rodimba. It has octatonic scales on G, G sharp and A, overlapping, and it’s definitely a pitch instrument. It’s sounds something like a marimba. So other than that, what I have done is, really, and on purpose, create elements, or use elements, which are somewhat random and themselves improvised as the building of the instrument happens. So that when I have the instrument, it’s not so much an instrument that represents a system, it’s an instrument that represents a kind of territory to explore. So for me I like the idea that an instrument has a character, a life of its own, and it speaks to us as we play it. We have an interaction between one another as we’re playing together. And I think that happens naturally with all instruments and players anyway, ultimately, when they’re improvising at least. But I’m sure otherwise, too. So, it’s again the same thing that all musicians feel and sense and experience in relationship to their instrument. AC: Yeah, especially looking around [the studio], thinking of the visual aspects of the instrument. So how do the visual aesthetics play in. So how much of the design of a particular instrument is visuals versus sound quality versus playability? Sort of, the physical aspects? TN: Well, if I were to order them in priority, I would say first is sound. And that then mandates technique, and technique mandates design. And once you get the design, you can decorate it however you want. But you need to get that essential design that works to get that essential sound that works, because of that essential action that makes the object sound like that. So beyond that, since you’re building something, you might as well make something attractive, interesting, fun, curious. So if you are going to have rods why not bend them and make antennae? And as you’re doing that visual thing, you’re also gaining some kind of acoustic thing because you’re changing the harmonics of the rod. It’s different than a rod that was straight. So like for the Crab, I have three bends in the rod, or two bends in the rod, and they look like little crab feet. But they also create a very distinct acoustic sound because of that. They have a high sound and a very low sound. When I got the Lukie Tubes that was because I had these plates that had been sanded for looks only. But had they not been sanded, the tubes wouldn’t have worked. So sometimes the decoration leads to actual new designs for acoustic reasons. AC: So in terms of being able to play the instruments, how does one “master” one of these instruments? Is there a discipline for learning how to play them and for practicing? TN: Well, it’s a lot of hours of practicing. But as you’re practicing, you’re doing two things. You’re getting familiar with the instrument, but you’re also practicing improvisation, you’re also practicing composition. And you’re practicing composition and improvisation in the context of that instrument with that format and those techniques. So you’re working always on two things – that’s the way I work. Maybe somebody could more objectify it but it’s hard for me to separate the work on the instrument alone from the work on the instrument as a compositional device. AC: So is that process a little bit different when it’s having somebody else play one of the instruments? TN: Well, when somebody else plays one, I see different things happening, I hear different things happening. I see different orientations, different approaches. Sure. I’m just an individual. I’m not a prototype, or a metatype, or whatever. Every time I’ve seen people play my instruments they come up with ideas I hadn’t thought of, or approaches or sounds or styles or all kinds of stuff they come up with on their own. Including what kids do. AC: So, thinking about the performance coming up where there are also a lot of guests that are also using traditional instruments, what is the process for working with performers who are using standard instruments? Is it more about working with the individual performers who were invited, or is it about trying to pair instruments? TN: It’s more the relationship with the performers who happen to have those instruments but also happen to have a history of playing with me. And so I’ve played innumerable hours with everybody that is going to be on this program. So we all know each other very well. And that’s a really nice thing if you’re doing free improvisation, which most of it will be. But these are master players, master improvisers, and I’m just damn lucky to have a situation where I can call on people like that. So many of them, and such a diversity! And that’s what we discovered with the TD Skatchit project. And that was David’s idea and it just was spot-on in terms of connecting with his culture and bringing the boxes into that. In this particular performance, it’s going to be people I’ve always played with, but I’ve always played with people who play traditional instruments. It’s actually easier for me to play with people who play traditional instruments than people who play experimental instruments. Actually much easier. AC: So you were mentioning that there is going to be a lot of free improvisation. Has there been a lot of work with formal composition with your instruments? TN: Yes, the second piece on the program, Plasticity, is written by Allan Crossman, a good friend of mine, who is a retired teacher from Concordia in Montreal. And he is an active composer. He wrote this piece for the Soniglyph and orchestra, and we got it performed by the San Francisco Composers Chamber Orchestra. And we had about four or five rehearsals of that and then did it live and I have a recording of that. But we are going to be doing a piano and Soniglyph version of that piece. That’s the most formal piece, the most absolutely composed piece. But still within that, the composition is about what parts of the instrument I’m playing and what techniques I might be using but not exactly what I’m playing. Whereas what he has, some places are very specific and some are quasi-improvised. AC: Following up on that, any thoughts on how one would notate for your instruments? 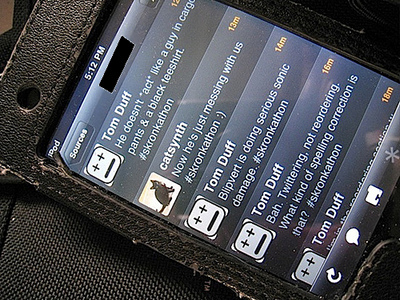 TN: [Laughter] One of the big reasons I got into improvisation with these things! I mean, they [composition and improvisation] happened at the same time, but, my god, what a nightmare trying to notate for this. TN: Especially the boxes. Good damn luck with that. It’s like notating electronic music. For one thing, what’s the point? As if somebody is going to one: learn how to read it; two: learn how to play it with that notation, with those techniques; and three: get even remotely close to what you were thinking. So no, you know the thing about experimental instrument and stuff is trying to push the envelope of what music is. Part of that is getting away from the idea that everything is compositionally controlled. But it isn’t, like, burning your bridges. We still have relationships to composers and compositions. It’s just that we sit around the same table now and they take into account what we thrive on and vice versa. It’s great. AC: So in the context of that newer relationship between composers and performers, would you like to see more compositions? AC: And then, anything thoughts on how your instruments have affected people in this community or beyond who think about music, whether they’re performers or listeners? TN: It would be difficult to say what effect I have on anything. That part is kind of a hope and a prayer that maybe there would be some influence that is positive in somebody’s life and just let it go at that. I’ve given away a lot of instruments. I’ve given away a lot of CDs. It’s my inclination to give things away rather than sell them when it comes to music anyway. To me it’s like this is food for the soul and so how can we put a price on that. So yeah, I end up giving away a lot of instruments. And that is, I think, an appropriate way to dispense with this stuff. If somebody says, “well I can do that”, then go home and do it. Rent [Romus of Outsound Presents] went home, and he and CJ each made a box, after [the workshop at the 2010 Outsound Music Summit]. Great! It’s kind of like that. If teachers saw what the potential of the Skatchbox was for elementary school kids or junior-high school kids, kids that hadn’t gotten the big dose of cynicism that’s going to come down the line yet. So that they don’t see it as silly or stupid or not cool or whatever. But that they see it as just interesting. Which is the virtue of kids.